An adventure, witty in style and brilliant in characters; some violence and language. David Balfour is a young Lowlander from a respectable family, and that much he knows; but he never thought that family was anything more than respectable until, his parents dead, he is told to go to his father's brother, Ebenezer Balfour of Shaws. Armed with the new knowledge that he actually has any uncle at all, David sets out to seek his fortune and establish himself. But this simple goal launches him on a series of wild adventures that take him into the heart of the still-rebellious Highlands, bring him into contact with the Jacobite Alan Breck Stewart, and embroil him in the terrible Appin Murder. Can he survive to go home and claim the estate that rightfully belongs to him? For the most part, David is a steady, moral, God-fearing fellow (as far as that went for R. L. Stevenson, who was no Christian himself). He is upright of character, not only eschewing the usual vices of drink and cards, but trying in every circumstance to do what accords with his conscience. He does have an acquisitive streak in that he desires what rightfully belongs to him, but he is not miserly, as his uncle is. He is also very proud, though it does not necessarily lead him astray. Alan Breck is a wilder sort, but fiercely loyal to his friends and to the deposed Bonnie Prince Charlie. He and David debate several times regarding the Stuarts versus King George (David is loyal to the latter). Alan holds a violent grudge against all of the Campbell clan, and "The Red Fox" in particular; David remonstrates with him on this point, calling it un-Christian. Some characters are kidnappers, and Stevenson presents them in believable stripes. One man beats a ship's boy, and nothing is done by his mates to stop him. A character gambles away not only his money but also a friend's, and a quarrel ensues because of it. Alan is a good hand at the sword and delights in his own exploits. Like most of the Highlanders, he holds strong grudges against members of other clans. David has a Covenanter background and looks at life from a basically Christian worldview; Stevenson, while not a believer, knew his Bible. Scripture is occasionally referenced and David gives grateful prayers to God. He and Alan debate whether vengefulness is Christian or not, David holding that it goes against Scripture. Otherwise, there is little spiritual content at all. An attempt is made on David's life, and after that fails, he is knocked unconscious and taken aboard a brig to be sold as a slave in the Carolinas. A young boy is beaten frequently (his wounds are seen) and later he dies from the same; it is not "seen," but it is the most disturbing part of the violence. Alan and David are called upon several times to defend themselves, and fights ensue wherein a number of men are killed. A man is murdered, and when David and Alan are wrongly accused, they must flee for their lives (as a Jacobite, Alan already has a price on his head). David is attacked by a thief, and threatens in return to shoot the man. None of the violence (save perhaps the killing of the ship's boy, which is rather implied than stated) is gruesome, but fits the story's character as a novel of high adventure. Beer is consumed. Several seamen drink to excess, and one becomes grotesquely violent in consequence. Pipes of tobacco are smoked. God's name is sometimes taken in vain, particularly as the exclamation "Dod." "D*mn" is used several times by Alan. At times the book simply states that a character swears. 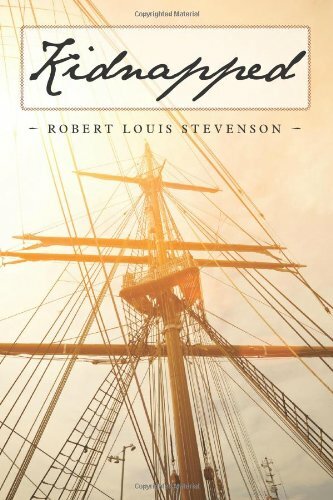 Like most of Stevenson's books, "Kidnapped" is a novel to be enjoyed first and foremost because of the author's gift at style and language. His incorporation of the Scottish dialect makes the dialogue wonderful to read, and even the frank Lowland mind displayed in the first-person narration is a delight. The characters, too, shine forth: David himself, stolid though he is, and also the brash and loveable Alan Breck. The plot itself - revolving both around the historical Appin Murder and the attempts of the fictional David Balfour to win his estate - is not the largest part of the story. "Kidnapped" is an adventure, far-flung and rich with the history and landscape of the places David passes, though not always fast-paced. If you have already found Stevenson's style to your liking, or if you like witty dialogue and sparkling characters, this is unlikely to disappoint.